MattDotZeb is a smasher from Massachusetts who plays Falco in Melee, and is considered to be one of the two best Falco mains in New England, along with th0rn. 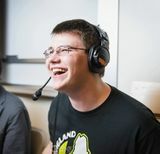 He is more well-known, however, for his work as a tournament organizer, having hosted series such as "Mass Madness" and "The Melee Games" since he entered the community. MattDotZeb is currently ranked 8th on the New England Melee Power Rankings. He has taken sets over many notable players, including Leffen, Ryan Ford, Crush, Swiftbass, DJ Nintendo, Kels, InfiniteNumbers, and dizzkidboogie. MattDotZeb is notorious for his upsets against top players; he sporadically defeats professionals far above his skill level, including Leffen, in tournament. He is equally as notorious for being upset by lower-leveled or unranked players, often quitting mid-match out of those sets. He has a positive record against Leffen, 1-0. This page was last edited on November 3, 2018, at 18:41.